WNS series oil (gas)-fired steam boiler is a novel one developed on the basis of foreign advanced technology in combination with the domestic development situations. Assessed by domestic experts, its comprehensive technical performances reach the domestic advanced level. This type of boiler mainly consists of the shell, internal furnace, tube plate, smoke tube, backflash chamber and furnace burner. 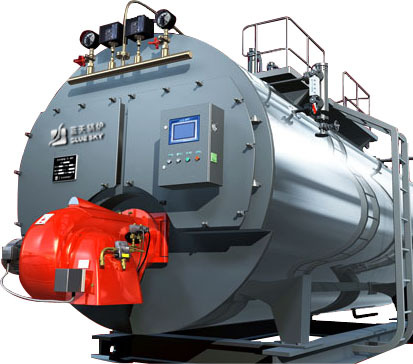 The boiler of evaporation capacity ≥2t/h adopts corrugated furnace and full-wet-back three-return strokes. The corrugated furnace can increase the furnace heating-surface, improve heat-exchange efficiency, adapt the boiler for thermal expansion and prolong service life of the boiler. The boiler of evaporation capacity ≤1t/h adopts thread pipe backflash type. The thread smoke tube can disturb gas laminar flow, enhance gas heat-exchange coefficient and thus render the boiler high thermal efficiency and extra high overload capacity. The designed diameter of the furnace is larger than that of the routine boiler so as to suit for burning of various kinds of fuels. The furnace burner is at the front of the boiler and the burning is under the slight positive pressure mode, with the flame passing through from the furnace, smoke tube to gas plenum. This type of layout is rational in structure, complete in burning, and high in thermal efficiency and good in safety, and makes the emission of dust and noise much lower than the state standards. This type of boiler adopts foreign-advanced furnace burner, which is ignited with automatic electronic mode, and the fuel is mechanically injected under high pressure. Its air flowrate is automatically adjusted in proportion and each action controlled with a programmable controller. Hence, it is high in automation degree, fast in booster of steam, and good in fuel oil atomizing degree and in thermal efficiency. It is automatically controlled with domestic advanced electronic detection circuits and the pump is stopped at high water level and started at low water level. It is also provided with indication units for low, normal and dangerous water levels respectively (with ultra-high water level alarm for boilers ≥2t/h). The dangerous water level is interlocked with the burner. In case of dangerous water level, the alarm will be sent out and the burner stopped to avoid damage due to lack of water. If 0#-10# diesel or heavy oil is used as the fuel，the oil-feed pipelines are fixed with 4 filtering units to keep the fuel clean. When heavy oil is used, a preheating unit shall be additionally installed on the pipeline. If natural gas is used, the bore of pipeline and gas supply pressure shall be correctly selected in accordance with the fuel manual. (1) Pressure controller: If the pressure exceeds the intentionally preset working pressure (but shall not exceed the rated working pressure), the contacts of the pressure controller will trip to disconnect the burning-interlocked control circuit and stop the furnace burner, and meanwhile send alarm to warm the operator to eliminate the faults. The boiler of capacity ≥6t/h are additionally fixed with steam over-pressure alarm and interlocking protector. (2) Spring type safety valve: When the steam pressure inside the boiler reaches the preset working pressure, the safety valve will automatically open to discharge steam outwards so as to ensure safety of the boiler. 5. This type of boiler occupies less space, is easier, safer and more hygiene in installation and operation than coal-fired boilers. They are widely used in enterprises, institutions, hospitals, schools, hotels and households, being an ideal substitute for the coal-fired boilers.